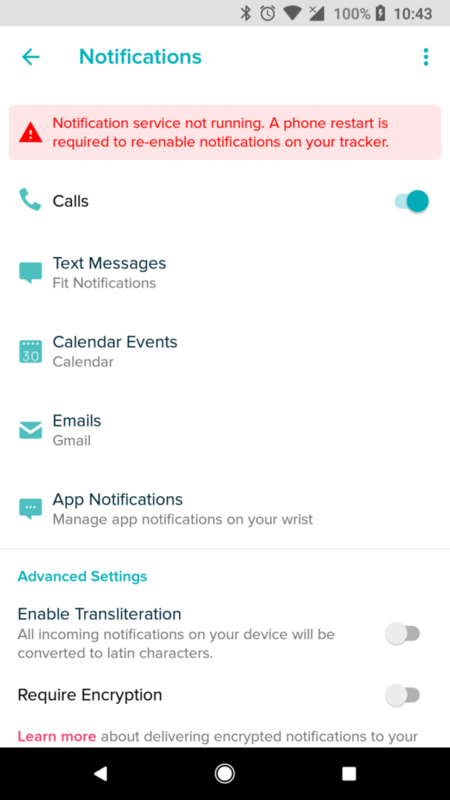 Screenshot of the Fitbit notifications settings page. As you can see, there is a big issue here as explained in the error message. The notification service is not running. You cannot get notifications with that error. UPDATE: A workaround is available to fix this problem. However, it is annoying. Click here to fix this! UPDATE #2: Reinstall the Fitbit app if you persistently get the “Notification service not running” issue. Hello users of Fit Notifications or anyone who is concerned about this issue. Please note that I have personally tested the latest update of the Fitbit app (April 19 2018) and it appears to completely break the notification functionality of the Fitbit app. No, this is not an issue with the Fit Notifications app not being compatible with the latest version of the Fitbit app. It is Fitbit app being broken. I tried to test the native notification functionality baked into the Fitbit app. Fitbit recommends you to restart your phone to re-enable notifications on the Fitbit tracker after an app update. They usually send a notification to remind you of this. That is why, after most Fitbit app updates, notifications suddenly stop working and they get fixed once you restart your phone. So, I tried this to see if I can enable notifications again. But sadly, no matter how many times I rebooted my phone (which is a Pixel 2 by the way) I could not enable notifications again. In fact, if I go into the Notification settings page of the Fitbit app, I see this error message on the top (see the screenshot on the right). I couldn’t clear the error even after numerous reboots to my phone. I even tried to send a test call within the Fitbit app and it did nothing. So, there you have it. Until Fitbit fixes the buggy update, it appears that the latest version of the app won’t work with notifications. NOTE #1: It may be entirely possible that this show stopping bug occurs only on some devices and not all. If that is the case then please try restarting your phone and re-syncing your Fitbit tracker with your phone. Hopefully that should fix the problem. NOTE #2: A lot of people in the comments section of the Fitbit app are complaining that the latest update is not letting them get notifications when the phone is in silent mode or vibrate mode. (Firstly, this seems to suggest that the latest version is working for at least some people, if only not in silent mode). So if this is the case, please disable silent mode on your phone if you are using it. I know a lot of you are power users who love to use this feature while the phone is silent to avoid double disturbance, and so I made sure that my app can be used in such a fashion. Sadly, Fitbit feels otherwise! UPDATE: Some users have noticed that this issue occurs with even earlier versions of the Fitbit app, as early as version 2.68. Users have reported issues regarding the Android app on the Fitbit community forums as early as March 26, 2018. You can try to downgrade your app (unofficially) to an earlier version by searching for an .apk file (i.e. the application installation file) for the earlier version. But please note that this is not a recommended approach as such .apk files may be tampered with and installing unverified software on your phone can damage it. Proceed with caution if you do this. You have been warned! I get notifications for maybe one day, then the error occurs. There is one and only one way to get things working again. An uninstall of the fitbit app, reinstall, re-enable and set up notifications again. But doing that nearly every day…? Hi there! You could try downgrading your Fitbit app, unofficially. There are some websites that host previous versions of the app (in an .apk file format). But doing so can be dangerous, especially if the file is tampered with. So, proceed with caution! Many of the settings you suggest (especially with the Battery settings) do not seem to exist on stock version (i.e. vanilla version) of Android running on my Pixel 2. However, I basically tried your suggested steps and it still does not work. This is not something we can fix on our own I am afraid. I suggest users to just relax and wait for an update. Some users reported success after downgrading to an older version of the Fitbit app. – Do you have the security patch from April 5, 2018 for Google (Pixel/Nexus) installed (https://source.android.com/security/bulletin/2018-04-01)? If so, the notification listener service should rebind every time you open the app and you shouldn’t be able to see this message. – Does the Fitbit app crash every time you restart your phone? No, the Fitbit app does not crash when I restart my phone, at least I have not noticed that. I will ping you if it does. Another quick question: are you using a Pixel 2 XL or regular Pixel 2? Can you send me the build number of the Fitbit app you are using as well as the build number of the Android OS? If you go to your phone settings -> search for “Special app access” -> “Notification access”, does “Fitbit Notification Service” show up and is checked? I am using Pixel 2 running Android 8.1.0 . The build number for my Android is OPM2.171019.029. The app version is 2.70. Yes, I enabled the Fitbit notification service. I can only get to that screen in the Fitbit app that is depicted in the above picture if I enabled this setting. The strange thing is that I don’t see anything about this issue on the Fitbit forums. As it affects their own notifications, I presume, not just for those of us running this app, I am surprised that more people are not complaining about it in the forum. By the way, I don’t see that Notifications not running error on my app. It doesn’t work, but no message. Hi! I have a brand new MI note 5 pro phone and a brand new versa. I am getting the same service not running error after trying everthing suggested in this forum. Is there a new solution available?? I am not in charge of the Fitbit app. If the Fitbit app is broken and gives you that error, there is no way to fix it on my side. You will have to wait and see if Fitbit will update their broken app. In the meantime, you could go back to an older version of the Fitbit app from https://www.apkmirror.com/apk/fitbit-inc/fitbit/. The apk installation files downloaded from that website should be safe, but as always exercise caution when obtaining software from third party websites. the key is in the power management. Andriod Oreo will not allow fitbit notification to run if you do not specifically enable it. Previous PostPrevious What to do when you realize you hate your course… Really late? Next PostNext [Update #1] Install latest version of Fit Notifications (2.9.16) to fix this automatically!